The western snowpack was seriously below average this year, and it was way below average in the Lower Colorado Region. It is early April, and that means it is time to check-in with snowpack data in California and the American West. On average, the snowpack reaches its maximum by April 1, after which it begins to shrink as it melts away. California and much of the West have a monsoonal precipitation pattern: the bulk of the yearly precipitation falls during the winter. Because the summer and fall are so dry, many regions depend on melting snow, which they collect into reservoirs. The snowpack serves as a kind of natural reservoir, collecting precipitation during the winter, and releasing it gradually as the snow melts. Snowpack is measured in inches of water equivalent. To equal an inch of melted water requires between 7 and 20 inches of snow, depending on how slushy or powdery the snow is. To quantify the snowpack, scientists calculate how many inches of snow are on the ground, and how much water it would represent if it were instantaneously melted. The result is called the snow water equivalent. Thus, 1 inch of snow water equivalent means that, no matter how deep the snow is lying on the ground, if you melted it, it would equal 1 inch of water. Figure 1. 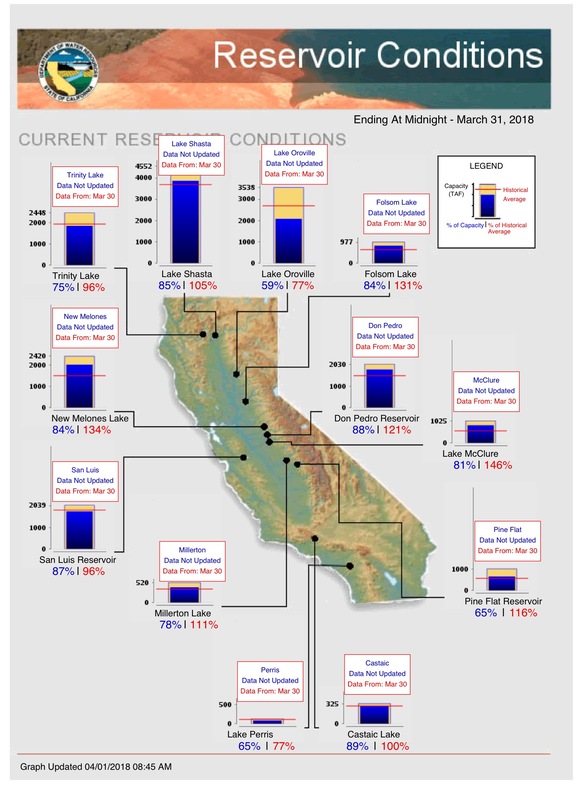 Source: California Department of Water Resources, California Data Exchange Center. Figure 1 shows the snowpack in California for the three major snow regions: North, Central, and South, with the snow water equivalent given along the vertical axis on the left. The dark blue line represents the 2017-2018 winter, and the line ends on March 29. The blue number at the end of each blue line represents the snow water equivalent of this year’s snowpack as a percentage of the historical average for that date. At lower right the three regions are combined into a single number, representing the snow water content of the entire state’s snowpack for 3/29/18. At the bottom left the chart shows the statewide percentage compared to what’s average for April 1. Through the end of February, this winter was the second driest on record, and the snowpack was something like 20% of average. March was a wet month, however, tripling the snowpack. Even so, that only brought it up to a statewide average of 57%. Figure 2. Source: National Resources Conservation Service. As you can see, the entire region has had a smaller than average snowpack. However, the snowpack in the Lower Colorado Region is particularly worrisome, as it is only 21% of average. Figure 3. Data source: Mammoth Mountain Ski Resort. The Mammoth Mountain Ski Resort publishes a detailed history of the snowfall at the resort, and I use it as an example of the snowfall in a given California location. Figure 3 shows the data. The total amount of snow at Mammoth Mountain through March 31 was 248 inches this year, compared to an average of 308 over the period from 1969-2018. The length of the colored bars for 2018 illustrates that more than half of the snow for the whole season fell during March. The chart also shows just how wet a winter it was last year, the second wettest in the record. Bear in mind that Mammoth Mountain is measuring snowfall, not snowpack. So, measurements of the snowpack indicate that it is seriously below average. What, then, is the status of California’s water supply? The quick answer is that for this year they should be fine. California’s water supply is impacted this year by an extraordinary circumstance: in February, 2017, the Oroville Dam suffered a failure of the main and emergency spillways, leading to the evacuation of 188,000 people lest the dam fail entirely (see here). It didn’t fail, but since then the reservoir has been partially emptied to facilitate repairs and improvements. Figure 4. Source: California Department of Water Resources, California Data Exchange Center (A). Figure 4 shows the data for the largest California reservoirs. On the chart, the blue bars represent the level of each reservoir on March 30, while the yellow bars represent the maximum capacity. The red line represents the historical average level of each reservoir on March 30. The blue number below the bars represents the amount of water in each reservoir compared to its capacity, while the red number represents the amount of water compared to the historical average for March 30. As you can see, most of the reservoirs are at or above their average for March 30, and only Lake Oroville is considerably below average. The region around Santa Barbara, however, remains in a serious drought. 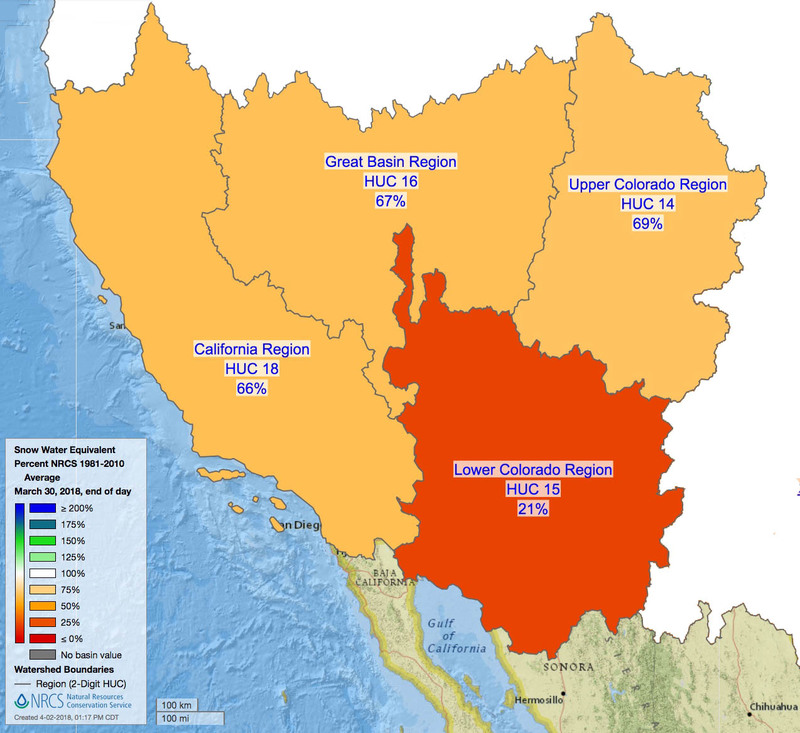 The two largest reservoirs in Santa Barbara County, the Cachuma and Twitchell Reservoirs, are at 40% and 2% of capacity, respectively (not shown on the chart). In addition to the California reservoir system, southern California relies heavily on water from the Colorado River. Lake Mead, the largest reservoir on the Colorado River, has been overused for years, and was even forecast to have a strong chance of going dry (see here). Figure 5 plots the water level at Lake Mead over the past year. Each year it fills with the spring snowmelt, and then is drawn down throughout the rest of the year. 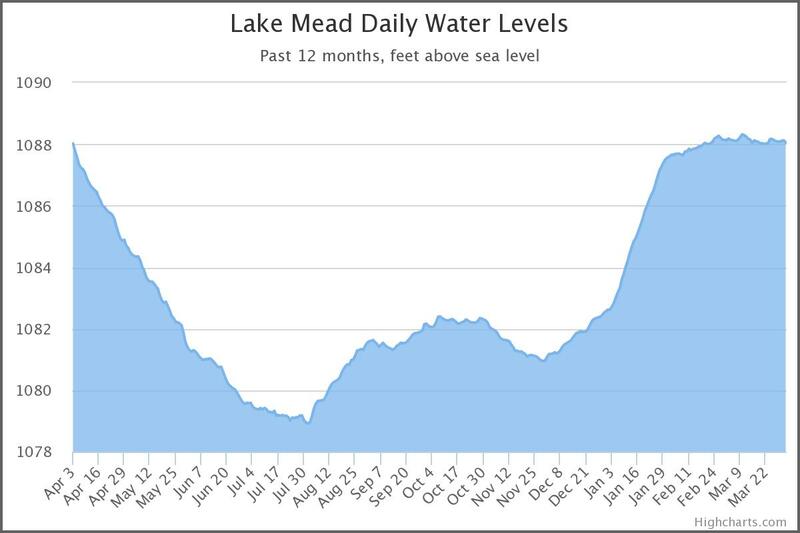 Beginning just after 2000 Lake Mead has suffered a steady and rather alarming drop. Last year, for the first time in many years, Lake Mead showed a year-to-year increase in its water storage. This year, as of April 1, the water level of Lake Mead is basically unchanged from last year. Lake Powell, a large reservoir upstream from Lake Mead, is up 16 feet from last year on this date. That is a significant increase, and it comes entirely from the large snowpack last year. So, what does all this mean? The snowpack this year was seriously below average, and it was way below average in the Lower Colorado drainage region. California’s reservoirs, however, appear to be in good shape except in the region around Santa Barbara. Lake Mead has not lost additional water, and the fact that Lake Powell has gained water means that officials may be able to move water from there to Lake Mead if needed. Thus, the water supply, for this year may be sufficient for California and for those regions that draw on the Colorado River below Lake Mead. 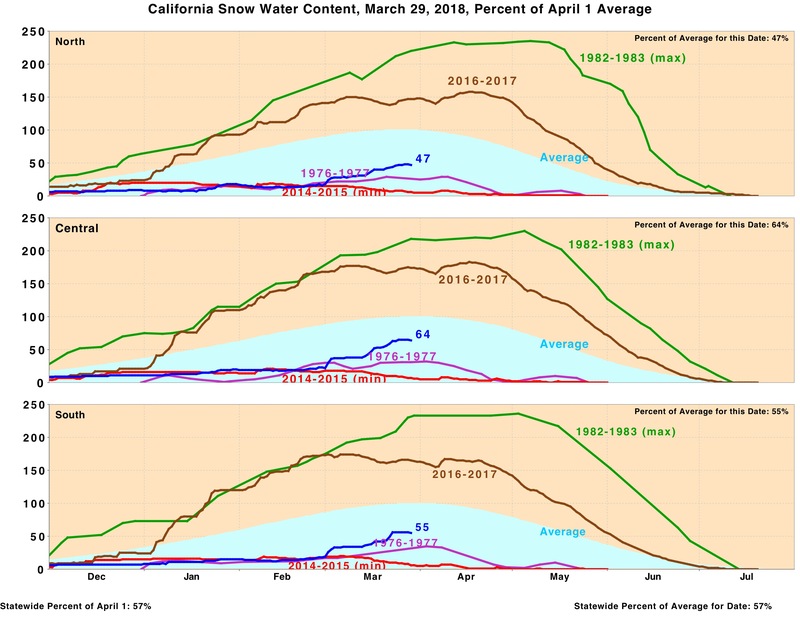 It is worrisome, however, that after having experienced a severe multi-year drought, and then only 1 year of high precipitation, California and the Southwest have returned to below average snowpacks. I have reported previously that climate predictions include a permanent reduction of the snowpack throughout the West (see here) and in California (see here). We will have to keep watching over many years to see how this plays out. California Department of Water Resources, California Data Exchange Center. Reservoir Conditions, 4/1/2018. Downloaded 4/2/2018 from http://cdec.water.ca.gov/cgi-progs/products/rescond.pdf. California Department of Water Resources, California Data Exchange Center. California Statewide Water Conditions, Current Year Regional Snow Sensor Water Content Chart (PDF). Downloaded 4/1/2018 from https://cdec.water.ca.gov/water_cond.html. lakemead.water-data.com. Lake Mead Daily Water Levels. Downloaded 4/1/2018 from graphs.water-data.com/lakemead. Mammoth Mountain Ski Resort. Snow Conditions and Weather. 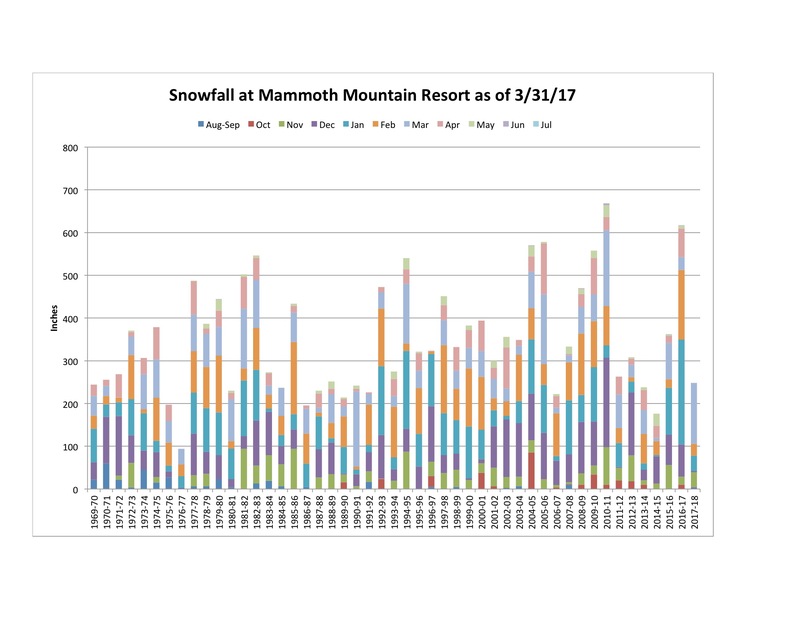 Viewed online 4/1/2018 at https://www.mammothmountain.com/winter/mountain-information/mountain-information/snow-conditions-and-weather. National Resources Conservation Service. Open the Interactive Map. Select “Basins Only.” On the map, select “Percent oNCRS 1981-2010 Average,” “Region,” “Watershed Labels,” and “Parameter.” Downloaded 4/2/2018 from https://www.wcc.nrcs.usda.gov/snow/snow_map.html. Santa Barbara County Flood Control District. Rainfall and Reservoir Summary, 4/1/2018. Viewed online 4/2/2018 at https://www.countyofsb.org/uploadedFiles/pwd/Content/Water/Documents/rainfallreport.pdf. By mogreenstats in Climate Change, Weather Patterns on 2018/04/05 .